Forty Martyrs of England & Wales | ADULT CATECHESIS & CHRISTIAN RELIGIOUS LITERACY IN THE ROMAN CATHOLIC TRADITION: hosting ONLY True Christians!! !, or "How to think Catholic!!" Blessed Charles Mahoney. This Irish Franciscan was another victim of the evil Titus Oates. Charles Mahoney (alias Meehan) was born in Ireland around 1639/40. He and his three brothers, James, Terence and Christopher, were educated by their uncle, Fr Bonaventure OSF, who was guardian of St Anthony’s College in Louvain. Three of the boys, Charles, Terrence and James, followed in their uncle’s footsteps and became priests. In 1674, several years after his ordination, Charles was sent to Germany to study theology. He remained there for two years then spent another two years in Rome, preaching and teaching at the Irish Franciscan College of St Isadore. Then, in 1678, Charles was sent back to Ireland. Charles was aboard a ship heading for home when disaster struck. In a raging storm his ship was wrecked off the coast of Wales. With some of his belongings, he managed to swim ashore near Milford Haven in West Wales. The plucky Franciscan decided to travel North, on foot, in the hope of finding a ship bound for Ireland. Unfortunately, Charles didn’t get very far. In June 1678 he was arrested not far from Denbigh and imprisoned in Denbigh Gaol. In the spring of 1679, Charles Mahoney was tried, found guilty of being a Catholic priest, which was considered treason, and sentenced to be hanged, drawn and quartered, the usual punishment for treason. On 12th August 1679, Fr Charles Mahoney was taken from his prison, tied to a horse-drawn hurdle and dragged to a spot outside the town. Here the awful sentence was carried out. The months of July and August 1679 were busy ones for the anti-Catholic authorities. Titus Oates and his fellow perjurers must have been smugly satisfied too. Executions of Catholic priests were being carried out in various parts of England and Wales. In Wales, Fr Philip Evans SJ and a secular priest, Fr John Lloyd, were barbarously executed in Cardiff on 22nd July. Just over the border, in Hereford, eighty year old Fr John Kemble, another secular priest, met his fate on 22nd August. Fr Kemble, a cousin of St David Lewis, had spent fifty-four years ministering to the Catholics of Herefordshire and Monmouth. On that same day Fr John Wall, a Franciscan, was executed at Red Hill, Worcester. Fr Wall, who ministered mainly in the Worcester area, was a classmate and friend of our Last Welsh Martyr, St David Lewis. Fr David Lewis SJ followed his friends and fellow priests to martyrdom on 27th August at Usk. All five were canonised in 1970 when Pope Paul VI canonised the Forty Martyrs of England and Wales. The British Museum is in possession of a one page document entitled “The Last Speeches of Three Priests that were executed for Religion, Anno Domini 1679”. The document reads; “An Account of the words spoken by Mr Charles Mahony, an Irish priest of the holy Order of St Francis, who was executed in his Habit at Ruthin in North Wales, August 12, 1679. In 1678, Titus Oates worked many English people into a frenzy over an alleged papal plot to murder the king and restore Catholicism in that country. In that year Catholics were legally excluded from Parliament, a law which was not repealed until 1829. John Wall was arrested and imprisoned in 1678 and was executed the following year. John Wall, in religion Father Joachim of St Anna, was the fourth son of Anthony Wall of Chingle (Singleton) Hall, Lancashire. He was born in 1620, and when very young, was sent to the English College at Douai in Belgium. From there he proceeded to Rome, where he was raised to the priesthood in 1648. Several years later he returned to Douai and was clothed in the habit of St Francis in the convent of St Bonaventure. He made his solemn profession on January 1, 1652. So great was the estimation in which he was held by his brethren, that within a few months he was elected vicar of the convent, and soon after, master of novices. In 1656 he joined the English mission, and for twelve years he labored in Worcestershire under the names of Francis Johnson or Webb, winning souls even more by his example than by his words. At Harvington to this day the memory of Blessed Father Johnson is cherished, and stories of his heroic zeal are recounted by the descendants of those who were privileged to know and love the glorious martyr. Some of the charges raised against Father Wall when he was captured, were that he had said Mass, heard confessions, and received converts into the Church. He was accidentally found, in December, 1678, at the house of a friend, Mr Finch of Rushock, and carried off by the sheriff’s officer. He was committed to Worcester jail, and lay captive for five months, enduring patiently all the loneliness, suffering, and horrors of prison life, which at that time were scarcely less dreadful than death itself. Father Wall’s martyrdom took place on Red Hill, overlooking the city of Worcester, on August 22, 1679. He was a much respected local figure and the crowd’s reaction showed that their sympathies were entirely with him. Many of the onlookers, who were mostly Protestants, wept, and the Sheriff reportedly cried out “End Popery? This is the way to make us all Papists!” His remains were buried in the cemetery adjoining the Church of St. Oswald of Worcester. His head was kept in the convent at Douai until the French Revolution broke out and the community fled to England. What became of it, then, is not known. He was an outstanding academic, perhaps the most intellectually distinguished English Catholic priest of his generation. The Catholics of Worcester found consolation in remarking, as a proof of his sanctity, that the grass around the grave of Blessed John Wall always appeared green, while the rest of the churchyard was bare. A large crucifix was raised in the little Catholic churchyard at Harvington to the memory of this saintly son of St Francis, Father Joachim of St Anna. “It was the year 1535. For almost a millennium England had been a Christian nation, its culture, traditions, and morality informed by the faith. Marriage, like most things, was understood according to the teachings of Jesus Christ, as preserved and taught by His Church down through the generations. About fifteen years earlier, rumors began to circulate of a renegade monk in Germany who railed against abuses in the Church and used these faults to challenge the authority of the Church herself. This made waves among political leaders looking to increase their power, among Church leaders concerned for their flocks and the welfare of the Church herself, and among the common folk who, much like people today, were simply trying to make sense of the issues amidst a sea of catchy slogans, songs, and the print propaganda circulated by those advocating for change. Reports of such rumblings on the Continent slowly made their way across the Channel. The well-educated may have encountered the writings of these Reformers, as they called themselves, and of well-known literary figures such as Erasmus and England’s own Sir Thomas More, who sought to defend the Catholic faith. But for the average person, English life remained much the same as it had. After all, King Henry VIII himself had written a book defending the sacraments of the Church and had been honored by the Pope as a Defender of the Faith. England was soundly her Catholic self. However, things changed rapidly–and most English Catholics probably didn’t see it coming. Soon there was a new Queen, Anne, and a new Archbishop of Canterbury, Cranmer, both of whom were sympathetic to new ideas. The government issued an Act of Succession, supporting the legitimacy of the King’s divorce and his marriage to the new Queen, and an Act of Supremacy, declaring the King head of the Church in England. The King forced his subjects to support these acts even while he, himself a rebellious son of the Church, was excommunicated by the Pope. 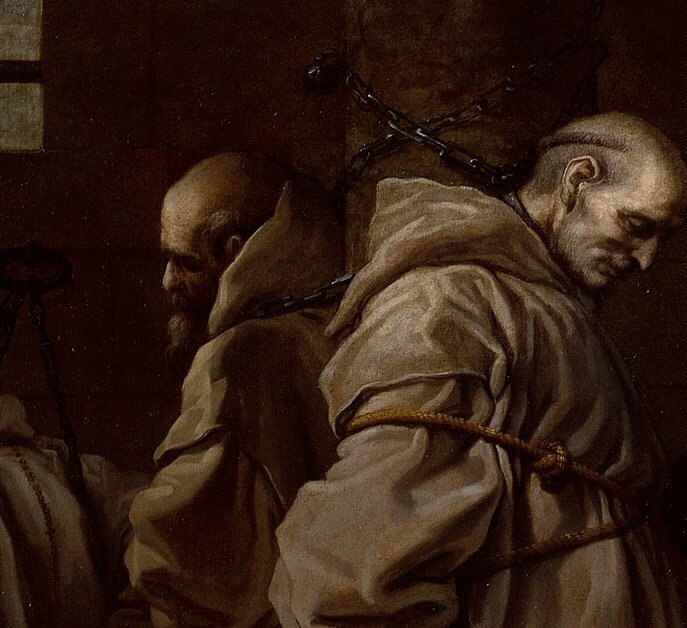 A number of monks were executed for dissenting. Now, in the summer of 1535, two well-respected figures, Bishop John Fisher and the former Lord Chancellor of England, Sir Thomas More, were publicly executed in London. Their only crime had been to hold fast to the traditional faith and understanding of marriage that had so abruptly fallen from grace in English society. There was no room for debate in the public square. The law of the land had claimed supremacy over the law of God, and faithful adherents to the latter were branded treasonous. Certainly, to be a faithful Catholic in such times demanded heroic faith, the faith of the martyrs. But it can be hard for us to relate to such heroic virtue. That’s because such virtue is overtly public, and exercised against clearly recognizable external threats. Our faith, however, tends to be more private. The kind of virtue we most commonly practice is in our personal struggles against the usual temptations to seek lesser goods than God: to sleep in instead of going to Mass on Sunday or to neglect nourishing our relationship with God through prayer, spiritual reading, and charitable acts instead of slothfully succumbing to another Netflix series or binging on Facebook. But there is another, more public level of spiritual warfare we must be attuned to. We Christians on earth are the Church Militant and, just like any other army, we must be prepared to recognize and respond to threats from the enemy, Satan. The challenge is to recognize that we live in trying times–times as volatile as those that Sts. John Fisher and Thomas More saw. But we often view martyrdom, and the social and political challenges that inspired the witness of the martyrs, as something set in the distant past. We are largely ignorant of the fact that around two-thirds of all Christian martyrs died only recently, in the 20th century. Are there threats on the horizon in the United States that will require heroic virtue from Christians here? No. They aren’t on the horizon; the threats are already here. Fifteen years ago hostility toward the faith was present on certain politically-correct college campuses, for example. Coming to college in 2001, I saw for the first time posters declaring “zero tolerance for intolerance,” which I discovered was Orwellian for “zero tolerance for dissent.” I realized that one day there might be zero tolerance for traditional American values and Christian beliefs, for myself and other dissenters. This day came quickly. While no one here is currently facing martyrdom as in Africa, Asia, and the Middle East, jobs are being threatened and people face legal, media, and social harassment for following the teachings of Jesus Christ–teachings that are, with increasing frequency, labelled as bigoted, hateful, and intolerant. To live one’s Christian faith is considered treasonous to society. Not only do public figures and religious leaders face such treatment, but average Christians do as well. Heroic virtue is required here and now. “In the presence of God and of Christ Jesus, Who will judge the living and the dead, and in view of His appearing and His kingdom, I give you this charge: Preach the word; be prepared in season and out of season; correct, rebuke and encourage—with great patience and careful instruction. For the time will come when people will not put up with sound doctrine. Instead, to suit their own desires, they will gather around them a great number of teachers to say what their itching ears want to hear. They will turn their ears away from the truth and turn aside to myths. But you, keep your head in all situations, endure hardship, do the work of an evangelist, discharge all the duties of your ministry. “If my children lose their faith, I have failed as a mother!” -Mary D. McCormick, oft repeated to her children. (Alias Anderson.) Last martyr under Queen Elizabeth I; b. according to Challoner at Vales in Yorkshire (i.e. presumably Wales, near Sheffield), but, according to the Valladolid diary, a Lancashire man; executed at Tyburn, 17 Feb., 1603. He arrived at Reims 16 July, 1592 and on 21 Aug. following was sent to Valladolid, where he arrived 23 Dec. Thence, 1 Oct., 1594, he was sent to Seville where he was ordained. According to one account he was arrested at Clement’s Inn on 12 Feb., but another says he had been kept a close prisoner in Newgate for a week before he was condemned at the Old Bailey on the 15 Feb., under stat. 27 Eliz., c. 2, for being a priest and coming into the realm. He was betrayed by one of his trusted friends to the Lord Chief Justice, who expedited his trial and execution with unseemly haste, and seems to have acted more as a public prosecutor than as a judge. At his execution he showed great courage and constancy, dying most cheerfully, to the edification of all beholders. One of his last utterances was a prayer for the queen. 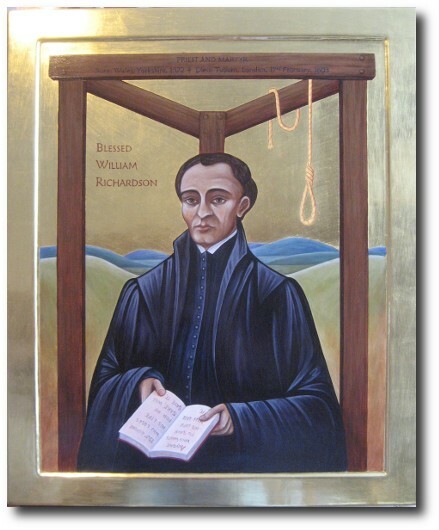 “On Saturday, 15 February, 2014 in the chapel dedicated to Blessed William Richardson, Fr Don Stoker blessed a picture and a poem dedicated to the martyr. 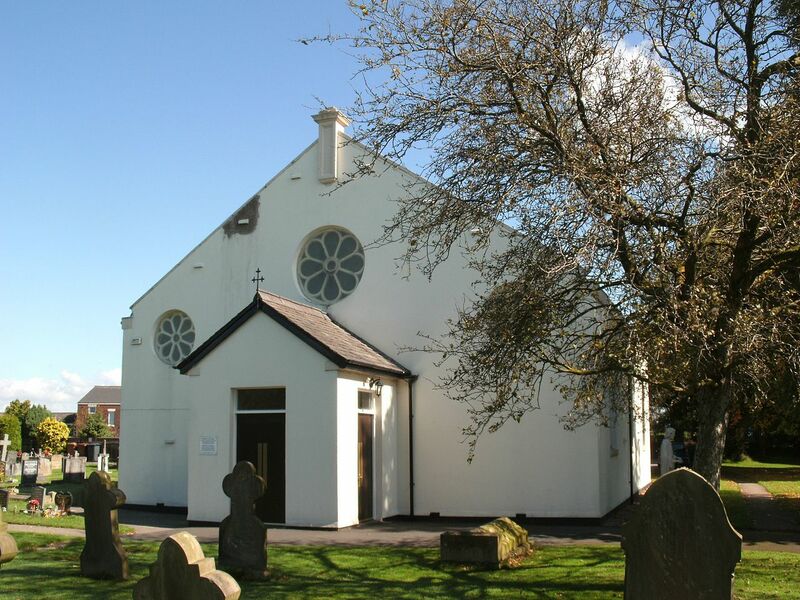 The blessing came just a year after the former St Augustine’s Chapel, Kiveton Park, was rededicated to Blessed William Richardson on 15 February, 2013. This previously almost unknown local martyr grew up close to where the South Yorkshire, Derbyshire and Nottinghamshire borders meet. Margaret and Terry Murphy worked tirelessly for many years to bring about a wider recognition of William. Sadly, Margaret’s husband, Terry, did not live to see the rededication of the chapel but Margaret shared her memories and reflections during the Mass of Dedication. “It will come as no great surprise when I say to you that today has seen a hope fulfilled and many prayers answered, and at last Blessed William Richardson can now be honoured in this village of Wales, a man who gave his life, like so many others, so that we can meet and worship in peace. William’s father came into this area from Lancashire to find work, and settled in Waleswood, at what is now known as the far side of Rother Valley Park and that long time residents knew as the hamlet of Bedgreave (William’s birthplace). As the medieval mill still stands in the same place, it is perhaps safe to say that his father’s employment was that of a miller and that William himself received some elementary education at the hands of a parish curate. We know from the Entry Book in the English College in Spain that William was a convert to the Catholic faith and was received into the Church by one of the clergy at Wiesloch, where at that time he was working. He was called to the priesthood, attended the English College in Spain, studying Philosophy and Theology, and was ordained priest there in 1594 and then returned to England. Most of William’s life was spent working in London often with the legal profession in the Inns of Court. He visited prisons as an ordinary visitor, to take Mass to Catholics imprisoned for their faith, and he was sentenced to death after being betrayed by a priest catcher. His execution took place on Tyburn Gallows, by the barbaric act of being hung, drawn and quartered on 17 February in 1603. There is no knowledge of his last resting place, but if we can find a King under a car park, we may one day learn of his last resting place. William’s death was in the reign of Elizabeth I and he was the last priest to be murdered at that time. Elizabeth I died one week later. Bishop Challoner tells us he accepted his death with such constancy and faith, and praying for the Queen, that impressed his executioners. I hope we can make his name well known in this area and beyond. It is a sad fact that we had no knowledge in this area, in spite of the teaching in school. We knew a lot of Catholic history, by learning about the monks of Roche Abbey and the monastic settlement situated on the right hand side of the road leading to Todwick from Kiveton Park. As school children, we were taken to visit the five pre-Reformation churches: Aston church, Todwick, Harthill, Wales and Thorpe Salvin. You can see even today in Thorpe Church the Chained Bible and the Leper’s Squint. We are indebted to the monks for the footpaths leading to the churches and villages that we use for the Five Churches Walk. The monks lodged at the farm house across the road from Wales Church. So how did we come to know about William Richardson? Whilst the M1 was being built through the village, a large number of Irish people were employed and they came with their families and caravans (which were housed on a farmer’s field down Manor Road). Also a number of very welcome people came from the North of England, the men to work in the Kiveton Pit, and they settled with their families in the new houses we know as the White City. Both the Irish M1 people and the folk from Newcastle brought with them good Catholics, but we had no Mass centre in this area and I think it was Fr Cavanagh who approached the landlord of The Lord Conyers to see if the concert room could be used. Permission was given. What a joy. Mass to be celebrated in this village for the first time since the Reformation and for us, Terry and I, our eldest son serving at that first Mass, what a privilege. Now we had a Mass centre, but what about a priest!! Fr Cavanagh was already saying Mass at Thurcroft and Dinnington, so we turned to St Mary’s College at Spinkhill and Fr Peter McArdle came to our aid and said Mass for us. Men in the congregation took turns in bringing Father to The Conyers and it was one Sunday that after Mass, he said he didn’t feel well and it was our turn to take him back. We took him to our house for a hot drink, and it was whilst he was with us, he said he had been doing some research into the village history and had come across the family of William Richardson. I could hardly believe my ears, so in my excitement I said that we had a very active Union of Catholic Women/Mothers, would he come one evening to give us a talk and let us learn more. Bless him, he did and it is due to Fr Peter we got to know about Blessed William. Soon afterwards we acquired the Salvation Army building, the present building, and Fr Peter became our regular visiting priest, much loved and when he retired, our Mass was and is celebrated on Saturday evenings. ‘All will be well, all will be well and all manner of things will be well’. How blessed is a martyr’s heart? How feared is he of the Lord? To live a life of the Father’s will. And not be a-feared of the sword. I hailéd from this pleasant Vale. A settler of Bedgreave ville. Lived and learned of the Father’s love. Thus called to do God’s will. To Rheims I ventured so to go. With true fellows of the Word, I trained. My time was well and truly served. And in blessed Seville was ordained. My soul was complete as I ministered help to common Spanish folk. But my heart lay in England. That danger-full land. For ‘twas to be my yoke. This millers lad with a converts zeal. In the time of her Tudor reign. A recusant born to serve and pray. Aware of past brothers, slain. To London, then. Richard Anderson, I, did seek out a place to pray. Though I feared I must hide in this protestant town. Who’d have a poor priest to stay? Soon treachery tore my soul apart at the Inn of the Court. Betrayed at The Gray’s by an unknown voice. My countenance did show no fear. The crime of priesthood lies upon my head. ‘Tis no crime to serve you, O Lord. My trial was swift in this heartless place. No defence could I afford. “Treason”, they said. Treason, the charge. Guilt in my Catholic way. Oh, heart, stay cheered. Oh, will be strong. Stay with me, Lord. I pray. What fate will lie before me now? Is death now soonest near? Although my heart and soul may bleed, these eyes will shed no tear. Sent hence to Tyburn to please the crowds. I prayed openly as I was led. For the queen I prayed. For her heart and soul. All heard the words I said. The ‘Triple Tree’ Gallows be my darkest fate. As town folk came to jeer in haste they stared at this witnessed scene. The noose came down and held its grip on this wintry February Day. Though ‘fore death was mine and my Lord I saw, they did not let me sway. Let down was I, to bear more pain. Cut asunder. Disembowelled. Though death is mine, eternal life will live once again in my heart. No matter where my body lies in the bitterest forgotten earth. Lord consecrate my joyful soul. And bring it to rebirth. John was born in Wales in 1577. Although he was not a Catholic, he was taught by an elderly priest. So, as he said later, he was always a Catholic at heart. John went to Oxford University in England for a while. Even though he was a Protestant, his respect for the Catholic Church prevented him from signing the Oath of Supremacy, which denied the authority of the pope. He had to leave Oxford, so he went to Paris, where, it is reported, upon viewing Notre Dame, he converted to Catholicism. John lost no time after this in taking steps to become a priest. He went to an English college in Spain and became a Benedictine monk. His great dream of going back to England came true three years later. He and another monk were given permission to set out for that land. They knew the dangers they would meet. In fact, they did not have long to wait before trouble began. They entered England wearing plumed hats and swords at their sides. Soon, however, they were arrested for being priests and sent out of the country. St. John Roberts went back to London again in 1603 to help the thousands of people who fell victim to the plague. He worked day and night to keep the faith alive during a time when Catholics were persecuted mercilessly. Several times he was captured, put in prison, and exiled, yet he always came back. The last time Father John was arrested, he was just finishing Mass and there would be no escape, having been followed by former priest turned spy John Cecil, who had compiled a dossier on the unfortunate Roberts for James I. He was taken to Newgate prison in his vestments. When asked, he declared he was a priest and a monk. He explained that he had come to England to work for the salvation of the people. “Were I to live longer,” he added, “I would continue to do what I have been doing.” When he refused to sign the Oath of Supremacy, he was condemned to death. On 5 December he was tried and found guilty under the Act forbidding priests to minister in England, and on 10 December was hanged, drawn, and quartered, at the age of thirty-three, along with Thomas Somers, at Tyburn, London. It was usual for the prisoner to be disembowelled while still alive, but he was very popular among the poor of London because of the kindness he had shown them during the plague and the large crowd which gathered at his execution would not allow this. They insisted he be hanged to the death so as not to feel the pain. His heart was then held aloft by the executioner who proclaimed: “Behold the heart of the traitor!” But the angry crowd did not provide the standard response of: “Long live the King!” There was deathly silence. On 17 July 2010, Metropolitan Seraphim of Glastonbury of the British Orthodox Church, accompanied by Deacon Theodore de Quincey, attended an Ecumenical Service at Westminster Cathedral in celebration of the 400th Anniversary of the Martyrdom of St. John Roberts. Abba Seraphim noted that as a Londoner he wanted to honor the humanitarian and pastoral ministry of the saint to Londoners; and that all those who are conscious of the problems of exercising Christian ministry in times of persecution would immediately value the saint’s determination as well as realizing the extraordinary sacrifice he made to fulfill his priestly vocation. Large contingents from Wales were in attendance and the service was bi-lingual. Archbishop of Canterbury Rowan Williams addressed the congregation in both English and Welsh. It was the first time Welsh had been spoken in a ceremony at Westminster Cathedral. The choral piece, “Beatus Juan de Mervinia” in both Latin and Welsh, was specially commissioned for the service from the Welsh composer Brian Hughes. 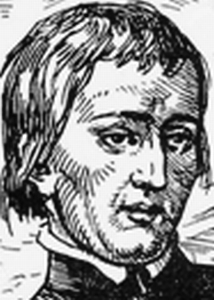 John Almond (or, aka Lathom or Molyneux, his aliases when incognito) was born at Allerton near Liverpool of Catholic parents about 1565, a time when being a Catholic was against the law. John spent much of his childhood in Allerton, near Liverpool, and at Much Woolton in Lancashire for his school years, before moving to Ireland with his parents where he was to finish his education and stay until reaching adulthood. He then went on to study in Reims, France, where he pursued his vocation into the priesthood. 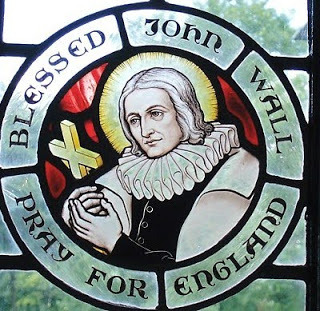 At the age of 20 he went to the English College in Rome where he would be ordained into the priesthood in1598 and then returned to the dangers of England as a missionary priest in 1602. Remembered as a great public debater, it was during the end of his time in Rome that he gave a public defense of theses that cover the whole course of philosophy and theology, and known as the “Grand Act” which was warmly congratulated by Cardinal Caesar Baronius and Cardinal Francesco Maria Tarugi. 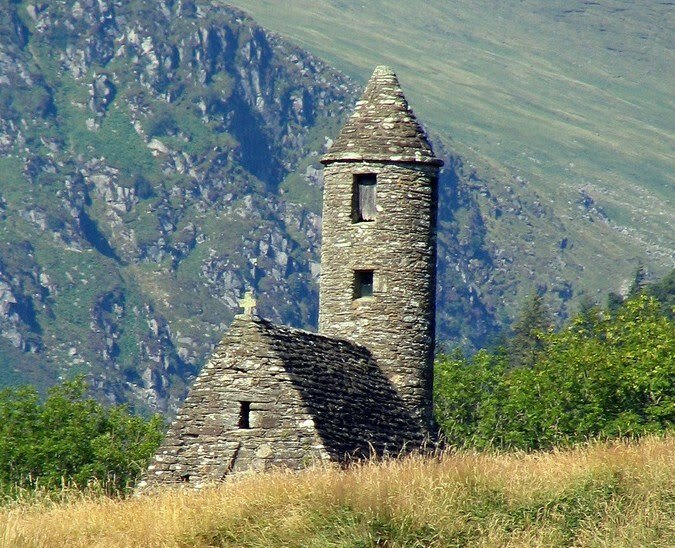 John’s love for his homeland and his fellow English Catholics made him eager to return and once there he travelled from house to house, village to village and town to town ministering to Catholics and sternly defending the Catholic Faith to those that opposed or questioned him. Saint John Almond never tired of trying to win back Protestants to the Catholic creed through his discussion and modesty. Saint John Almond continued to minister to the faithful and labored in his mission for 10 years, during that time he would eagerly speak out against the anti-Catholic powers of the state. He was first arrested for his papist behaviour in 1608, and then again in 1612 for high treason on account of his priesthood. 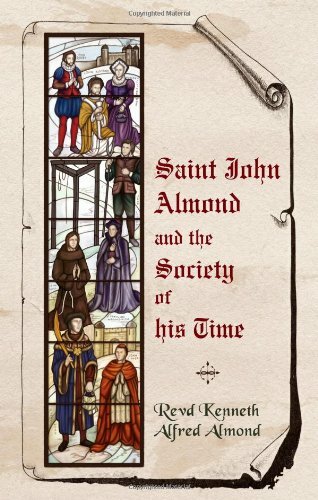 He had many debates with the Anglican authorities that would try to convince him that the Catholic Church was wrong but they soon found that Saint John Almond was unbeatable in discussions on the subject. This lead to him gaining many enemies in the higher Anglican clergy, including Dr King, the Protestant bishop of London. It was during the November of 1612 that seven priests made good their escape from prison. The successful escape was considered to infuriate the Catholic persecutors and it was the Protestant bishop of London, Dr King, who was most irritant at John Almond. Thus it was on the 5th December 1612 that Saint John Almond was taken to Tyburn to be hung, drawn and quartered. He was known as a ‘reprover of sin’ and many considered him as a good example to follow because of his ingenious and acute understanding, sharp and apprehensive in his conceits and answers, yet complete with modesty. 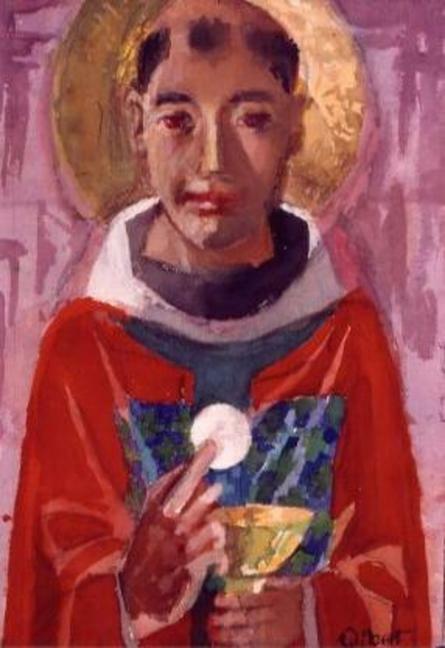 Saint John Almond was full of courage and was ready to ‘suffer for Jesus Christ, who had suffered for him’. He courageously displayed modesty and humbleness and died with the name of Jesus upon his lips. He was committed to Newgate and within a few months was brought to trial as a seminary priest. Having been duly convicted he was hanged, drawn, and quartered on 5 December 1612 at Tyburn, London. On the scaffold he flung some seven or eight pounds in silver, with his (rosary)beads, his points(? ), and his (penetential/uncomfortable garment) discipline, for those to get them who would, and gave to the hangman an angel, not to spare him, but to treat him as he should. He had come hither, he said, to shed his blood for his Savior’s sake, Who had shed His blood for his sins. In which respect he wished that every drop that he would shed might be a thousand ; that he might have St. Lawrence’s gridiron to be broiled on, St. Peter’s cross to be hanged on, St. Stephen’s stones to be stoned with, to be ript, ript, ript, and ript again. Then, being in his shirt, he kneeled down, and often repeating “In manus tuas, Domine, &c.”—“Into Thy hands, O Lord, I commend my spirit ”—he waited till the hangman was ready, without any sign of fear; but, ever smiling, he protested he died chaste, but not through his own ability or worthiness, but by Christ’s special grace, and that he ever hated those carnal sins, for which the Catholic religion had been slandered. At last, the cart was drawn away, and with the words “ Jesu, Jesu,” his soul flew to Him for Whom he shed his blood, Tyburn, December 5, 1612. A group of Catholic male martyrs, aged between 24 and 80 years old, including George Haydock and sixty-two laypeople and religious. Sixty-three of these martyrs were ordained Catholic priests. Twenty-two were laypeople from various social ranks and walks of life. These martyrs were arrested, tried, and executed particularly during the reign of Elizabeth I (r. 1558-1603) and Oliver Cromwell (r. 1653-1658), the Lord Protector, because they refused to accept statutes from these monarch/dictator that denied the Catholic Church’s role in their homeland. George Haydock, singularly praised in this beatification, was born in 1556 at Cotton Hall, England, the son of Evan and Helen Haydock. He was sent to Douai, France, and then Rome, Italy, to be educated. George was ordained a priest on December 21, 1581, probably at Reims, France. He returned to England to begin a missionary apostolate but was arrested soon after and placed in the Tower of London.He spent a year and three months in confinement in the Tower of London, suffering from a malarial fever he first contracted in the early summer of 1581 when visiting the seven churches of Rome. About May, 1583, though he remained in the Tower, his imprisonment was relaxed to “free custody”, and he was able to administer the Sacraments to his fellow-prisoners. During the first period of his captivity he was accustomed to decorate his cell with the name and arms of the pope scratched or drawn in charcoal on the door or walls, and through his career his devotion to the papacy amounted to a passion. On 16 January 1584, he and other priests imprisoned in the Tower were examined at the Guildhall by the recorder touching their beliefs. He frankly confessed, with reluctance, that he was eventually obliged to declare that the queen was a heretic, and so seal his fate. On 5 February 1584, he was indicted with James Fenn, a Somersetshire man, formerly fellow of Corpus Christi College, Oxford, William Deane who had been ordained priest the same day as himself, and six other priests, for having conspired against the queen at Reims, 23 September 1581, agreeing to come to England, 1 October, and setting out for England, 1 November. In point of fact he arrived at Reims on 1 November 1581. On the same 5 February two further indictments were brought, the one against Thomas Hemerford, a Dorsetshire man, sometime scholar of St John’s College, Oxford, the other against John Munden, a Dorsetshire man, sometime fellow of New College, Oxford, John Nutter, a Lancashire man, sometime scholar of St John’s College, Cambridge, and two other priests. The next day, St Dorothy’s Day, Haydock, Fenn, Hemerford, Munden, and Nutter were brought to the bar and pleaded not guilty. Haydock had for a long time shown a great devotion to St Dorothy, and was accustomed to commit himself and his actions to her daily protection. It may be that he first entered the college at Douai on that day in 1574-5, but this is uncertain. The Concertatio Ecclesiae says he was arrested on this day in 1581-2, but the Tower bills state that he was committed to the Tower on the 5th, in which case he was arrested on the 4th. On Friday the 7th all five were found guilty, and sentenced to death. The other four were committed in shackles to “the pit” in the Tower. Haydock, perhaps in case he should die by a natural death, was sent back to his old quarters. Early on Wednesday the 12th he said Mass, and later the five priests were drawn to Tyburn on hurdles; Haydock, being probably the youngest and certainly the weakest in health, was the first to suffer. An eyewitness gave an account of their execution, which John Hungerford Pollen printed in the fifth volume of the Catholic Record Society. Haydock was twenty-eight, Munden about forty, Fenn, a widower, with two children, was probably also about forty, Hemerford was probably about Haydock’s age; Nutter’s age is unknown. Pope St John Paul II beatified George Haydock and the other martyrs on November 22, 1987, The Solemnity of Jesus Christ the King of the Universe. “This feast of Christ the King proclaims that all earthly power is ultimately from God, that His Kingdom is our first and lasting concern and that obedience to His laws is more important than any other obligation or loyalty. Thomas More, that most English of saints, declared on the scaffold: “I die the King’s good servant but God’s servant first”. In this way he witnessed to the primacy of the Kingdom. Today we have declared Blessed another eighty-five martyrs: from England, Scotland and Wales, and one from Ireland. Each of them chose to be “God’s servant First”. They consciously and willingly embraced death for love of Christ and the Church. They too chose the Kingdom above all else. If the price had to be death they would pay it with courage and joy. 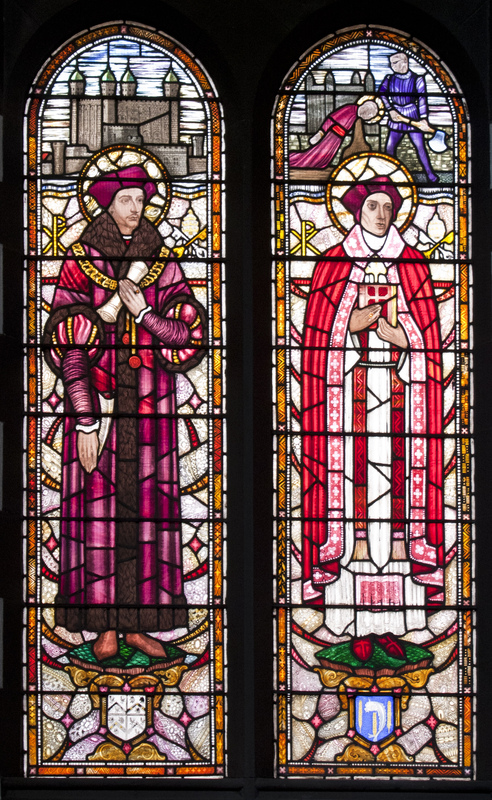 Blessed Nicholas Postgate welcomed his execution “as a short cut to heaven”. Blessed Joseph Lambton encouraged those who were to die with him with the words “Let us be merry, for tomorrow I hope we shall have a heavenly breakfast”. Blessed Hugh Taylor, not knowing the day of his death, said: “How happy I should be if on this Friday, on which Christ died for me, I might encounter death for Him”. He was executed on that very day, Friday 6 November 1585. Blessed Henry Heath, who died in 1643, thanked the court for condemning him and giving him the “singular honour to die with Christ”. Among these eighty-five martyrs we find priests and laymen, scholars and craftsmen. The oldest was in his eighties, and the youngest no more than twenty-four. There were among them a printer, a bartender, a stable-hand, a tailor. What unites them all is the sacrifice of their lives in the service of Christ their Lord. The priests among them wished only to feed their people with the Bread of Life and with the Word of the Gospel. To do so meant risking their lives. But for them this price was small compared to the riches they could bring to their people in the Holy Sacrifice of the Mass. The twenty-two laymen in this group of martyrs shared to the full the same love of the Eucharist. They, too, repeatedly risked their lives, working together with their priests, assisting, protecting and sheltering them. Laymen and priests worked together; together they stood on the scaffold and together welcomed death. Many women, too, not included today in this group of martyrs, suffered for their faith and died in prison. They have earned our undying admiration and remembrance. These martyrs gave their lives for their loyalty to the authority of the Successor of Peter, who alone is Pastor of the whole flock. They also gave their lives for the unity of the Church, since they shared the Church’s faith, unaltered down the ages, that the Successor of Peter has been given the task of serving and ensuring “the unity of the flock of Christ”. He has been given by Christ the particular role of confirming the faith of his brethren. The martyrs grasped the importance of that Petrine ministry. They gave their lives rather than deny this truth of their faith. Over the centuries the Church in England, Wales and Scotland has drawn inspiration from these martyrs and continues in love of the Mass and in faithful adherence to the Bishop of Rome. The same loyalty and faithfulness to the Pope is demonstrated today whenever the work of renewal in the Church is carried out in accordance with the teachings of the Second Vatican Council and in communion with the universal Church. Central to this renewal, to which the Holy Spirit calls the Church, is work for that unity among Christians for which Christ Himself prayed. We must all rejoice that the hostilities between Christians, which so shaped the age of these martyrs, are over, replaced by fraternal love and mutual esteem. Seventeen years ago  forty of the glorious company of martyrs were canonized. It was the prayer of the Church on that day that the blood of those martyrs would be a source of healing for the divisions between Christians. Today we may fittingly give thanks for the progress made in the intervening years towards fuller communion between Anglicans and Catholics. We rejoice in the deeper understanding, broader collaboration and common witness that have taken place through the power of God. 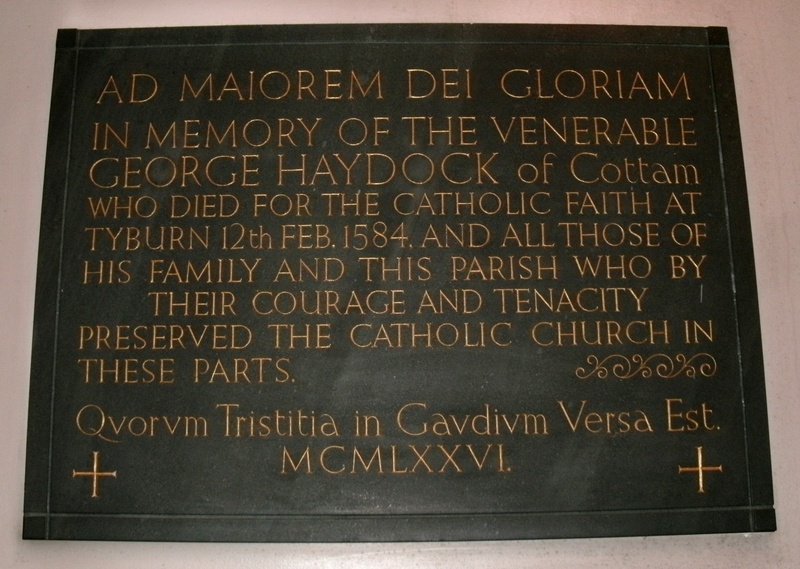 -plaque honoring Blessed George Haydock in St. Andrew’s & Blessed George Haydock’s Catholic Church, Cottam, Lancashire, UK. Blessed Martyrs of England, Scotland, Ireland, and Wales, pray for us! We’re hearing a lot about martyrdom in the news these days. Not so much Christian martyrdom, although that is regular, albeit unreported here, in more distant places in the globe; but another religion. Christians, from the earliest Roman persecutions, were called to witness to Jesus Christ. That’s what the word martyr means: witness. To be close to the beloved, recently deceased martyrs, and in prudence for their own protection, Christians would celebrate the Eucharist in the catacombs. This is where the Catholic custom of relics of saints, especially martyrs, comes from. Even when a physical church building is dedicated to a saint, and a relic of the saint is placed beneath the altar stone in the center of the altar, this recalls those early remembrances of the Last Supper celebrated on the tombs of the martyrs. Montanism was an early Christian heresy. Modern day Pentecostalism is the closest example we have to relate to today in attempting to understanding what Montanism was then. As opposed to Catholics, ancient Montanists actively sought out persecution and martyrdom by the Romans. The Romans were only too happy to oblige. Christians are NOT to actively seek out martyrdom. If, in the course of doing the Lord’s will, they are offered the crown of martyrdom, we are to accept with equanimity. His will be done. His Kingdom come, on earth as it is in Heaven. We go to Him: our hope, our joy, our all. -from “The First and Second Diaries of the English College, Douay” (Douai), Introduction by founder Cardinal William Allen, Sep 29, 1568, the founder & head of the institution in its earliest years. 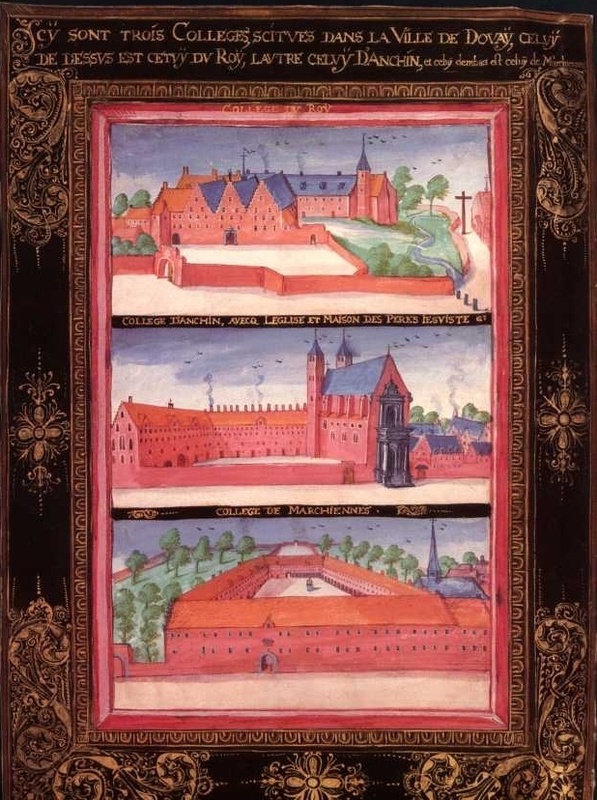 The English College in Douai, France was a school for English speaking seminarians to be formed in the spirit and letter of the Council of Trent (1545-1563), part of the Catholic Counter-Reformation. It was suppressed, finally, in 1793 as part of the French Revolution, and the students there then imprisoned for thirteen months in Doullens, Picardy. They were released in November 1794, returning to Douai for only a few months before obtaining permission to return to England. They found their first refuge at Old Hall Green, Ware, and dedicated the new work of the college to St Edmund of Canterbury on his feast day, November 16th, 1794. Lastly we should resolve to confess more frequently, communicate more devoutly and study more diligently, so as to prepare ourselves for the priesthood, which Christ has given us the opportunity of receiving even in exile, beyond all our hopes and deservings; seeing that we have found so much favor with foreigners that they assist us, nay more, that Christ’s own Vicar does not disdain us, miserable and unworthy though we be, but entertains us at his own expense for that end which God has predetermined. 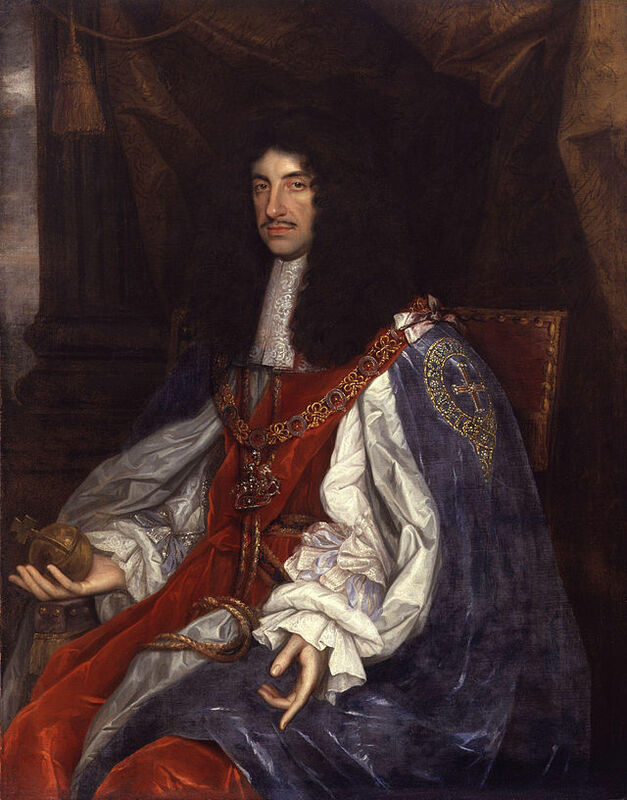 As the son of Queen Henrietta Maria, King Charles II was naturally imbued with Catholic sympathies; and the story of his deathbed, when Fr Huddleston brought the Blessed Sacrament to him from Queen Catherine of Braganza’s chapel, is well known. Yet during the collective mania whipped up by Titus Oates under the pretense of a “Popish Plot” (1678-79), King Charles did little or nothing to save Catholics who found themselves in mortal peril. The only potential victims on whose behalf he intervened were the Queen and Louis XIV’s emissary Claude de la Colombière, SJ, of prior note. Some 35 Catholics were executed, nearly all of them entirely innocent of treason. Of course, Charles was under intense pressure from skilful and unscrupulous politicians such as Lord Shaftesbury, who knew how to manipulate the mob. The essential point, though, was that the Merry Monarch had no intention of going on his travels again. It is not easy to warm to the complacency with which he appeared to regard the deaths of so many falsely accused men. One of these was John Plessington. The youngest of three children, he was born in 1636 into a Catholic family at Dimples Hall, Garstang, near Preston in Lancashire. His father fought for the King in the Civil War and was taken prisoner. 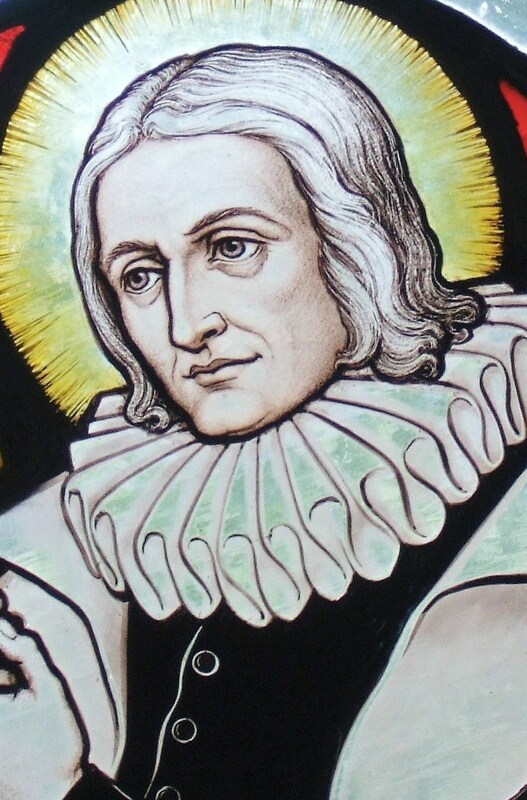 John’s vocation may have been inspired by a family chaplain called Thomas Whitaker, who was captured and executed in 1646. At all events, Plessington, having attended the Jesuit school at Scarisbrick Hall, near Ormskirk, followed Whitaker in being educated at Saint-Omer and Valladolid. While abroad, he went under the name of William Scarisbrick. In 1662 he was ordained in Segovia. The next year, however, ill health brought him back to England. For a while he served at the shrine of St Winifred in Holywell, North Wales. Then in 1670 he moved to Puddington Hall in the Wirral, as tutor to the Massey family. For a while Plessington was able to minister openly to the local Catholic population. But when the scare of the Popish Plot extended to the north, a timeserver called Thomas Dutton collected a reward for arresting him. There was no charge against Plessington, beyond his occupation as a Catholic priest, which sufficed for a death sentence. When the executioner came to measure him, Plessington joked that he was ordering his last suit. According to a local tradition, St John was implicated at the insistence of a Protestant landowner simply because he had forbidden a match between his son and a Catholic heiress. Three witnesses gave false evidence of seeing St John serving as a priest: he forgave each of them by name from the scaffold. St John was buried in the churchyard of St Nicholas’s, Burton, after Puddington locals would not allow his quarters to be displayed. Attempts to locate and exhume his body, as recent as 1962, have been unsuccessful but vestments associated with him are kept at St Winefride’s in Neston and a small piece of blood-stained linen is treasured as a relic in St Francis’s Church in Chester. In 1845, two skulls (Peter Snow and Ralph Grimston) were discovered under the stone floor of the ancient chapel of Hazlewood Castle, near Tadcaster, UK. Father Snow and Ralph Grimston were captured while journeying together to York. Father Snow was condemned to death by hanging, drawing, and quartering for being a priest. Ralph Grimston had previously been imprisoned for opening his home to priests. Ralph Grimston was condemned to death by hanging for having assisted Father Snow and for having attempted to prevent the priest’s arrest when they were caught. The Catholic Cathedral at Leeds, dedicated to St. Anne, has their skulls as relics, installed there when the new altar was consecrated. And, the University of Dundee reconstructed their faces based on their skulls. Nov 22, 2009, -Rev. Robert Barron, Cardinal Francis George Professor of Faith & Culture, University of St Mary of the Lake, Mundelein Seminary, IL & Founder, Word on Fire. “…Bishop Roach took me to the far more modest cathedral of Leeds, led me to the main altar and then invited me to examine a treasure. We crouched down and the bishop pulled out two heavy stones from the front of the altar, revealing a pair of well-preserved human skulls. 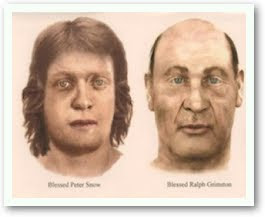 These, he explained, were the remains of Blessed Peter Snow and Blessed Ralph Grimston. Peter Snow was a Yorkshireman who had left Elizabethean England in order to study for the Catholic priesthood in France. At the time, of course, it was an offense to be a Catholic and a capital crime to be a priest. Snow had been ordained in Reims and subsequently smuggled into England, where he successfully ministered for two or three years, clandestinely celebrating the Mass, encouraging Catholics in their faith and instructing children in their catechism. Like many other priests in England at that time, he was protected by Catholic families who hid him away in cellars, attics and hiding-holes concealed behind walls. In May of 1598, he was making his way to York in the company of Ralph Grimston, a layman who was travelling with him for protection. The two Catholics were waylaid by authorities. Grimston drew his sword and shouted at the young priest to ride off, but they were captured. A trial was held in York, and Snow was convicted of being a priest and Grimston of harboring an enemy of the state. On June 15, they were executed. Grimston was hanged and then beheaded; Snow suffered the far worse fate of being hanged, slowly eviscerated and then cut into four pieces. Afterward, their heads were placed on pikes over the gate of the city in order to dissuade any who might be tempted to imitate them. The heads were taken down and for many centuries were hidden away, eventually coming to rest at a Carmelite monastery. When that monastery was sold, Bishop Roach, who knew of the existence of the skulls, asked that they be transferred to the Leeds cathedral and placed in the new altar. Before they were ensconced in the altar, the bishop allowed them to be examined by a forensic scientist in London who was able to reconstruct facsimiles of the faces, letting us see, after all of these centuries, what these men looked like. When I saw the photographs, I was deeply moved, especially by the face of the young priest (only 32 when he was killed). He looked for all the world like one of the students that I teach at the seminary. It just broke my heart to think that this courageous kid could have been treated with such brutality and inhumanity, simply for saying Mass and administering the sacraments. I mused on the depths of human cruelty, on a wickedness that beggars the imagination and is, nevertheless, on full display up and down the centuries to the present day. But above all, I found myself edified by his witness. During his years of study in France, he knew that he was preparing for a desperately dangerous mission. He was fully aware that many of his colleagues had already been arrested or killed, and yet he persevered. His ministry in his home country was grim, haunted, and fearsome. How many terrible days and nights he must have endured, and yet he pressed on. Looking at his placid face, I thought about the transforming quality of God’s amazing grace, what God’s love can do with our frail and deeply compromised humanity. Part of the genius of Catholic theology is that it clearly articulates both sides of the human condition. There is nothing naïve or blandly “optimistic” in Catholic anthropology. It takes original sin and its consequences with utter seriousness, arguing that human beings are weakened, twisted even, in both body and soul. No moral outrage — Auschwitz, Hiroshima, the Cambodian killing fields or Elizabethan totalitarianism — really surprises the Catholic mind, for as Chesterton said, “we’re all in the same boat and we’re all seasick.” At the same time, Catholic teaching holds that we are made in the image and likeness of God and destined, ultimately, to share in the very dynamics of the divine life, loving as effortlessly and radically as God himself. This Catholic hope outstrips even the fondest dreams of any humanist philosophy. Father Snow, Holy Priest! Ralph Grimston, Defender of Priests! Ora pro nobis!